El Topo and The Lamb Lies Down On Broadway (Jodorowsky and Gabriel). Alejandro Jodorowsky’s El Topo (1970) has rightly earned a place in the pantheon of cult cinema. Watch any number of documentaries or interviews with the man himself and the film will often stand proud as the pioneer of the “Midnight Movie”; a film obviously shown late due to its content but also exuding free reign over all of its creative aspects. Researching further into the film brings up a list of famous musicians as fans and as part of the film’s history. The oft repeated link between the film and Lennon/Ono is well spread, with the couple (and manager Allen Klein) responsible for its distribution (or lack of) and the film’s first showing in the UK. The list of musicians who admire it continue with names such as Bob Dylan and Marilyn Manson but one stands out as taking the relationship with the film and Jodorowsky much further. While the links may at first seem tenuous, there are strong, thematic ties between El Topo and Genesis’ 1974 album, The Lamb Lies Down on Broadway. The connection between the two comes in the form of the band’s lead singer, chief songwriter and front-man at the time, Peter Gabriel. Though this article is about reading the connections between the film and the album itself, it is worth charting some of the history between Gabriel and Jodorowsky which only adds further weight to the thematic readings. Gabriel is reported to have had interest in filmmaking even while with Genesis and it shows in his album’s auteur-like vision and concepts. It is unclear when exactly Gabriel saw El Topo for the first time but it matters little in the reading as the parallels are there even if the serendipity was realised in hindsight. This sharing of ideas, whether through influence or common interest, lead Gabriel to seek out Jodorowsky, proposing to let him adapt a film of The Lamb Lies Down on Broadway. They developed the script together but differed on who to cast as the lead with Gabriel obviously wanting to play the part himself, supposedly even auditioning for the role of Rael. The film obviously faltered at the development level, with various claims of a lack of financing and disagreements on scripts yet the ties between the two artists are still to be found in their work. El Topo follows a Zen gunfighter, fighting to be the best there is whilst living in a desert. This simple summation ignores the huge philosophical questions raised by the film, especially in its Psalms and Apocalypse chapters that see the character go through a genuine philosophical and religious journey that has more than a heavy hint of Freud. The Lamb Lies Down on Broadway tells a similarly epic story over a double concept album and it is within this story that the similarities between Gabriel’s and Jodorowsky’s interests begins to become clear. Lamb‘s story centres around the parallel journey of Rael, a young man lost in New York who is pulled underground to meet strange creatures in order to search for and rescue his brother, John. Already, the basic premise seems to sound like a potential Jodorowsky project. A number of songs share thematic content with scenes from El Topo leading to a general parallel to occur. The most obvious of these comes in the form of the underground dwellers in both media. During the Psalms section of El Topo, El Topo finds himself stuck in an underground cave, living with people who have inbred incestuously creating major deformities. These people are stuck living in the cave, unable to climb out of the hole in the top to the near-by town. Jodorowsky is instantly creating a sickly contrast between the disgusting bourgeois of the town and the helpless people left to rot in the cave. They are pulled by the magnet, believing they are free. No- I’m still Rael and I’m stuck in some kind of cave. 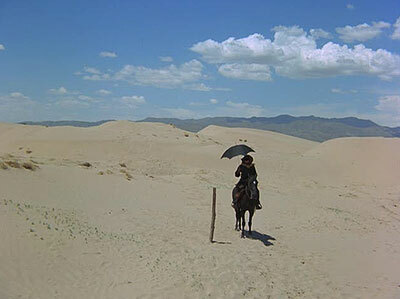 Whereas El Topo uses this as a Freudian punishment, Gabriel uses it as a means, almost a trade, to get to his brother. Sexuality in both El Topo and Lamb appears to be a tool for bargaining, punishment and enlightenment suggesting that both artists see it as more than a mere impulse. The bandits El Topo first kills are all shown very deliberately to be sexually repressed. One finds pleasure in the caressing of women’s shoes (before shooting them in wild frustration) while another lies down on the image of a women made of what looks like cocoa beans before eating her face off. Their faces are convulsed in pains. Hang on John! We’re out at last. Something’s changed, that’s not your face. This solidifies the idea of a journey being undertaken to find an identity; the very basic reading to be found on El Topo. Rael goes through much only to find that his brother is in fact himself. El Topo on the other hand goes through much to find himself, with the parallel being heavily drawn between the son that he is later reunited with. Even the woman that shoots him and steals away his companion is dressed exactly alike, as if the desert and the tasks he must undertake within it are gradually splitting up his personality which is only reawakened in the final massacre of the film. This initial split comes to the fore when the final Zen gunfighter beats El Topo by actually killing himself. He screams before finding himself in the cave that the film spends the rest of its time centring on. This is where El Topo and The Lamb Lies Down on Broadway really become part of the same ideology. Jodorowsky and Gabriel clearly want to show the development of emotional identity as not just a violent, complex process but one that is an epic journey. Whether it is through shocking violence, surreal imagery, Freudian torture or religious iconography, both creators endured with their own ideas, allowing them to emerge to one ultimate, Homeric goal. It is only a shame that their relationship couldn’t have been cemented with a definite, finished collaboration. Fascinating piece. A film and an album that I class among my favourites. Thanks for your insights! I’ve just learned today of Gabriel’s ties to El Topo. What I’m seeing in Pete’s epic is an analog to the ancient Hindu Vedas. “Got to get in to get out” means turning the mind inward, away from the world, to sort out one’s true identity. To ask the question “who am I” until all is revealed. “It” (the final song) is a perfect description of what the great teachers of the Vedas (and the Vedas themselves) called “That,” as in “Thou art That” as in you ARE God (as pure awareness). It also parallels Zen thought as well. Which then ties back through El Topo.